"Some of our defeat is not our personal sin; it is who we tolerate." 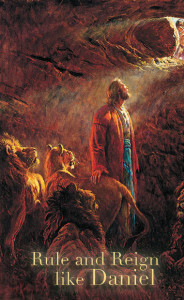 Daniel believed in God as Ruler, so he brought Heaven’s Rule into his earthly government and heathen captors. Do you rule and reign like Daniel did? The “mystery was revealed to Daniel in a night vision.” And praise burst from him, the worship of discovery. The discovery not of secrets but of God Himself! Out of his crisis, Daniel didn’t worship because of the answer that saved his life. He was filled with wonder and awe at the ‘name of God’ – His being and identity. And above all, the transcendent, absolute power and dominion of his God over nations, times and humanity. Knowing God was the outcome, and that is precisely what God wanted…to reveal Himself by the answer to needy prayer: His vast dominion over earth and His tender mercies toward man. The Daniel Adventure Has Just Begun! #116 Removing the Person of God #115 Kings Fall Away, Daniel Remains #114 Nebuchadnezzar Disappears #113 We Need to Know His Name #112 Humiliated Beyond Imagination and Rejoicing #111 And Still More Greatness Was Added #110 For the Sake of the Kingdom #109 God Alone Reigns Over All #108 The Most High Lives Forever #107 The King Was Transformed #106 The Right Use of My Mind #105 Pride Dissolves in Healing Solitude #104 Until You Learn Who Is God #103 Sudden Judgment Is Never Without Warning #102 God's Warning Is Not Empty #101 Here Stand Two Men Before Heaven #100 Sovereign Rule Over the Lowliest of Men #99 We Are ALL Without Excuse #98 A Position Holy and Unapproachable #97 To Recognize God as THE ONLY #96 Flourishing in Conquered Kingdoms #95 Stolen Glory Used to Glorify Self #94 A Testimony for Nebuchadnezzar #93 Conscripted in the Service of Babylon #92 Christ's Life Is Untouchable by Death #91 The Loosing of Bonds Comes Out of the Fire #90 All of Life Is a Contest of Power #89 We Are Forged by Earlier Fires #88 The Cross Was the Furnace of Christ #87 Christ Himself Walks My Walk #86 Loose and Walking, Not Hurt! #85 The Presence of God with You #84 Seeing the Fourth Man in the Fire #83 Our Endless Struggle: Is God GOD? #82 The Wisdom of God is to be Our Constant Source #81 In Surrender, We Will LET God #80 Let Be and Know That He IS God #79 Only ONE Reigns in All Power #78 Reverence and Fear of God #77 Human Beings Are Born Worshipers #76 Dying is the Only Way #75 The Test of Worship Will Come #74 They Needed Only to Know HIM #73 The Great Surrender of "But if not…" #72 God Chooses and His Servant Trusts #71 Finding Your Own Closet Meeting #70 Actual Life and Literal Death #69 We Have No Need to Answer #68 They Would Not Bow to the Tyrant #67 Being Made Ready for the Furnace of Fire #66 The Fiery Test of Love that Comes #65 Find Your Place Like Daniel #64 Everything Can Reveal Christ to Us #63 To Know God is to Behold Him #62 Israel Was Warned of Captivity #61 Daniel is THE Relevant Figure for Last Days #60 Faith in the One Source of All Need #59 We Are All Just Hungry Sheep #58 There is But One Work, Not Many #57 Food Everlasting as a Gift from God #56 Our Daily Bread is Spiritual, Too #55 The Work of Faith to Believe #54 Do We Lack the Most Basic Faith? #53 Any Crisis is Solved by Faith #52 A Deep and Gnawing Hunger #51 His Righteous One is Me and You #50 The Need in All Things is Faith #49 Daniel Believed and THAT is Our Work #48 Stability in God Comes from Need #47 The Immovable Rock in a Shaking World #46 A Life Founded on the Amazing Rock #45 Daniel's Solid Rock of Habitation #44 Our Secret Foundation Exposed #43 The Stone is Our Foundation #42 Christ, the Precious Cornerstone #41 The Dynamic and Explosive Power of the Rock #40 My Rock and My Salvation Always #39 Precious Cornerstone of Sure Foundation #38 The Foundation Stone in Zion #37 The Stone That Filled the Earth #36 The Fate of the Angel of Light #35 God in Heaven is Sovereign over All #34 To Be Eligible for Heavenly Access #33 Ready to Be an Instrument of Heaven? #32 Just How Great IS God's Rule?